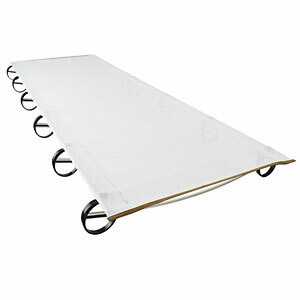 The UltraLite Cot is also sold as the Therm-a-Rest LuxuryLite UltraLite Cot. Tired of wet gear inside a tent? 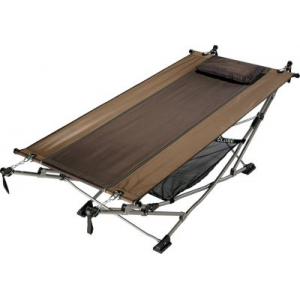 Put your tent over this cot and enjoy dry and comfort inside your tent even in a 5" all night rain. Did it last weekend. LuxuryLite Cots are just over 2 lbs. Rolls up into a sack less than 6"x 21 and has a lifetime guarantee. When it's cold put your Thermarest over that and sleep like you're at home...no rocks, no wet tent bottoms. I won't go without it anymore...that's 8 backpacks a year with Royal Rangers. Best gear I own. Keeps you 1" off the ground. Small in size for a cot. Keeps your tent floor dry in 5" all night rain. One of those things that are as good as the day you bought it...30 outings later. Quality material cost more up front. Yet it's worth it. Price $225, but again worth it. I turned 52. That was 2 years ago. 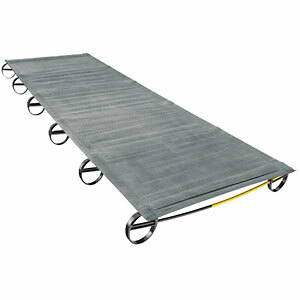 I bought a Luxuary Lite Cot from the maker down in Texas. Received a personal thank you letter and a lifetime guarentee with the makers personal phone number. I was impressed. Yes, it cost me $225. Yes, it's as good today as the day I bought it. After 2 years of 8 outings a year backpacking, floating, caving sleeping on this cot makes you a believer. I laugh at the younger guys. I too was younger once and could sleep on the hard cold ground on my 100 dollar Thermarest and was thanful for it. Yet geting caught in a 5" all night downpour in a flat area and listening to the rest of the backpackers talking of wet gear and what a wet cold nights sleep they endured... I just have to GRIN! Been there done that. I am dry. All the time. I put the cot on the ground. Put my Sierra Designs Electron 1 over it and stake down the tent. The tent goes over the cot and covers the entire cot and you can't tell it has a cot under it. So everything inside my tent is now 4" off the ground. When I climb in there is enough room to push my personal stuff to each side and I rest 1" above the ground. When it's 12 degrees out place my Thermarest on top of the floor of my tent that has the Luxurylite cot under it and avoid those small thorns and briars that poke through and flatten your pad. I then use my thermorest for insulation. There are tons of videos out there that show all about the cot and the setup. All I can say is once you use one of these you won't want to leave it at home. Last weekend we had a 5" rain. Backpacking in Hercules Glades in Southern Missouri. We had 9 in our Royal Ranger group and we had 4 hammocks and 5 tents. My two Serria Designs Electrons 1 and 2 were dry inside. The rest of the group all had wet gear. At the age of 45 I thought walking sticks were for sissies. GRIN! Now I have one I take and appreciate it. Crossing creeks, pushing brush the weight distrubution advantage... it's worth it. I am a lineman for the phone company and know there is no such thing as bad weather, just bad gear. I go out in all kinds of weather... if it don't cut it I won't recommend it. Knew of this as a DIY project. Glad to see the design is in production. "just over 2 pounds"? REI specs: 2 lbs. 12 oz I agree with your sentiment, not your semantics. He did state that he bought it from the manufacturer 2 years ago in Texas not from Cascade Designs so maybe the model he has is lighter and when Cascade bought it and put the Therma-Rest label on it they beefed it up a bit? Your right 12oz is enough to leave it at home. GRIN! While I am high and dry and warm in a 5" rain. Think about that 12oz. GRIN! In order to prevent spam. I couldn't post a picture of me on last weekends backpack trip showing the cot. Once you have slept on it. It's worth it. Again if all I was doing was walking 15 miles a day with a backpack on I might not care what I slept on. As it is we do a mile backpack in setup base camp and then day hike out 10 miles with a light day pack. The Royal Rangers are a Church Boyscout group and these boys don't have high end light gear. I learned along time ago. If I take them on a 12 miler with their gear..they don't come back and they tell others they hated it. I would too if I didn't have the right gear to make it a pleasure. Semantics 101. It has to work. I agree. One can pick a site that stays dryer. Most of our backpacks are leaving town on Friday night backpacking in the Dark setting up base camp in the dark. Then the next day we day hike with light day packs on. The 2 lbs 12oz is not a factor for this type of backpacking. Again if I was bootbackpaking 12 miles a day. I would just nix the comfort and carry a tarp and figure on loosing weight for a few days. GRIN! Not my idea of a good time yet some folks thrive on it. 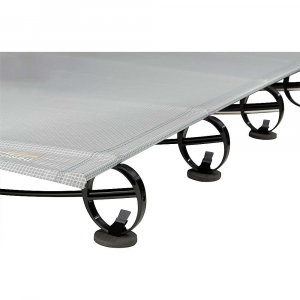 The LuxuryLite UltraLite Cot is not available from the stores we monitor. It was last seen January 15, 2013	at Mountain Gear. 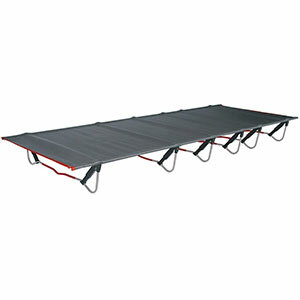 Also sold as the Therm-a-Rest LuxuryLite UltraLite Cot.